MILLION WINNER’S SISTER A MUST SEE! 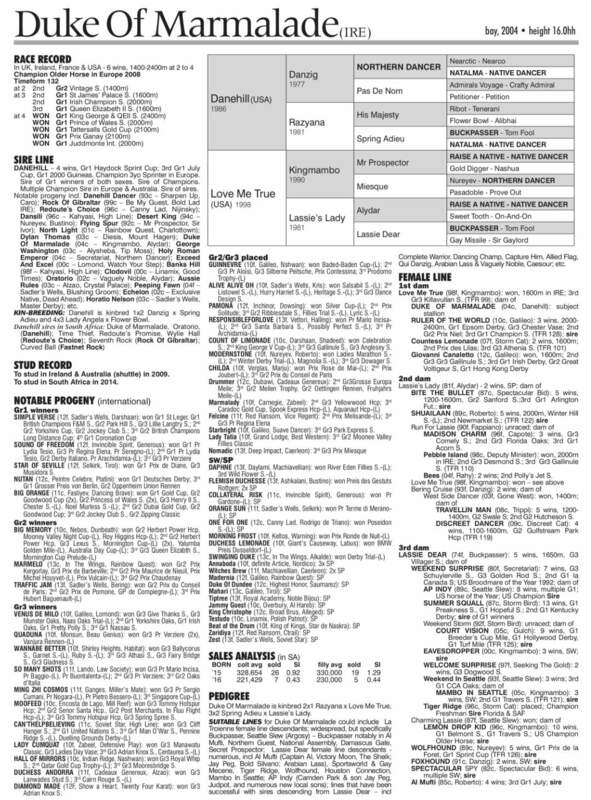 Boland Stud’s 11 strong Emperors Palace National Yearling Sale this year includes a half-sister, by a world leading sire, to a KZN Yearling Sale Million winner –from an outstanding family! 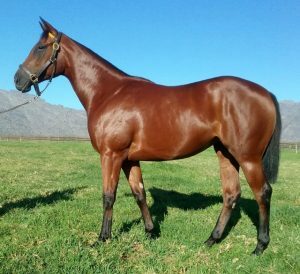 Lot 248 is a bay filly by Cartier Champion and five time Gr.1 winner Duke Of Marmalade out of Silvano’s Gr.3 placed daughter Romantic Moon. 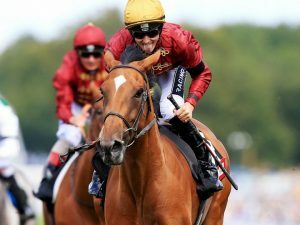 Duke Of Marmalade, himself a Danehill half-brother to Gr.1 Investec Derby winner Ruler Of The World, is a world class stallion, whose 50 plus stakes horses have banked over $37 million in prize money. 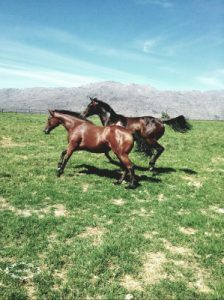 The Drakenstein Stud based Duke Of Marmalade’s top offspring includes St Leger winning champion Simple Verse, people’s hero Big Orange (whose six group wins include the Gr.1 Gold Cup), Gr.1 German Derby winning sire Nutan, French Oaks heroine Star Of Seville, and Gr.1 winner and Italian classic heroine Sound Of Freedom. Duke Of Marmalade is also responsible for group winning fillies Diamond Made, Venus De Milo, Traffic Jam, Wannabe Better and Duchess Andorra. His daughter on offer, lot 248, is a half-sister to talented Duncan Howells trained filly Lunar Rush, whose five wins included the KZN Yearling Sale Million and who has banked just under R1 000 000 in stakes. Romantic Moon, the dam of Lot 248, was a high class racemare, who won eight races up to 1200m and ran third in the Gr.3 Poinsettia Stakes. 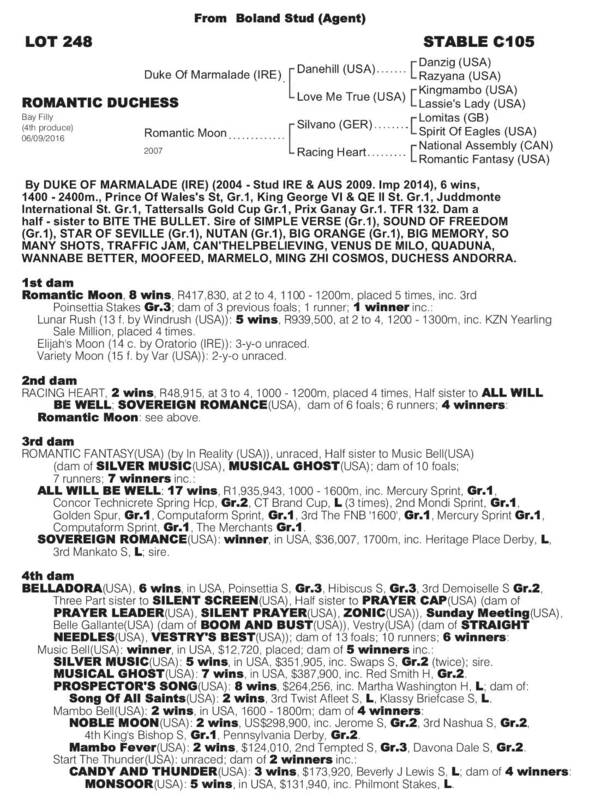 Romantic Moon herself is a full-sister to former sales topper Racing Free –who fetched R3.25 million as a yearling. Second dam, a winning daughter of prominent broodmare sire National Assembly, is a half-sister to Gr.1 Mercury Sprint hero All Will Be Well. 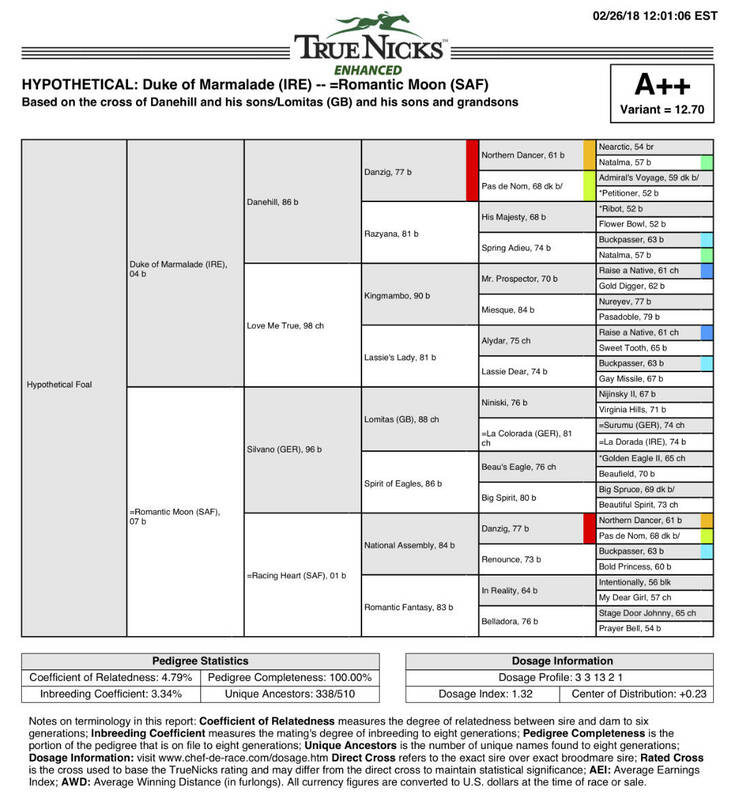 This is an outstanding US family, whose members include Champion 2YO Colt and successful sire Silent Screen and Gr.1 winners Graydar, Malibu Prayer, Mujahid, Ron The Greek, and Swagger Jack. This filly’s pedigree contains both classic stamina and blistering speed –and she is a must see for any serious buyer! This filly’s broodmare sire Silvano is fast making a name for himself as a damsire, with Silvano the maternal grandsire of high class stakes winners Wonderwall, Cosmic Light, Louisiana, Goodtime Gal and Joking.